With the price of prime property sky rocketing its no wonder savvy property owners are choosing to extend down to increase their property size rather than moving. Or, read on to find out what key factors you should be thinking about when considering the lighting design for your basement. Basement Lighting Design – Natural light. 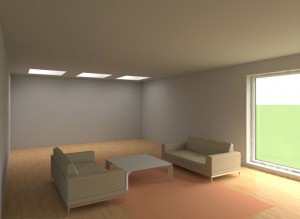 At the lighting design studio we can quickly simulate day lighting with computer models, which can help enable the visualization and placement of skylights and windows. The images below show the use of skylights and a glazed door from a light well. The coloured image domenstrates the expected luminance achieved from daylight. 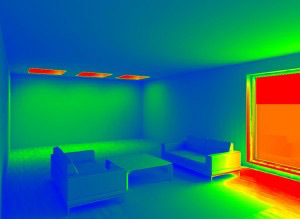 We also calculate other values such as daylight factor, and illuminance levels, which can help build up a picture of daylight penetration, if any. If there is no way of getting natural light into the space, one solution is creating ‘fake’ skylights using artificial light to replicate the colour temperature (Kelvin) of natural light. Typically around 5000-6500k, but it’s also possible to use dynamic light that changes colour temperature throughout the day to replicate daylight more accurately. 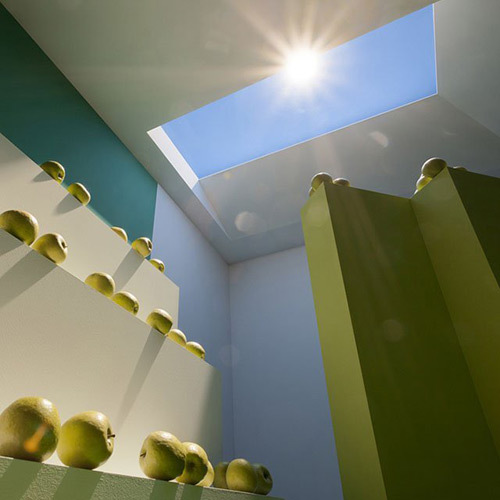 Alternatively Coelux produce an optical system based on nano technology to artificially reproduce daylight. Their groundbreaking design replicated the visual appearance of the sun and is truly impressive. The colour of your room will also have a massive and important impact on the way light interacts with the space. Of course lighter colours reflect light further, so it’s really worth considering the colour and finishes from the outset. More often than not basements are multiuse spaces. Relaxing, studying, entertaining, gym sessions, swimming pools, home cinemas, art galleries, wine cellars, in any combination are not uncommon. To accommodate the changing needs of a basement space, lighting clearly needs to be flexible. Adjustable fittings can help provide flexibility, lighting track and spotlights can be a good solution, and so can 5 amp sockets for removable floor or table lamps. Most importantly using multiple lighting circuits is key, so a lighting control system can really bring value to a basement space, giving the ability to recall light scenes at the touch of a button. It’s particularly important when relaxing and entertaining that the lighting can be dimmed, with key features such as artwork highlighted. Coloured light, or colour changing light (RGB) can be a playful way of emphasizing features in a basement space, although coloured light should always be used carefully and in moderation. An intuitive lighting control system is crucial when using coloured light, so check out our blog on lighting controls for further information on this. Basements often have limited ceiling heights, so to avoid that cavernous feeling you can sometimes get, it’s important to explore ways of getting light onto the ceiling. An obvious way is to use indirect wall lights, or wall sconces. 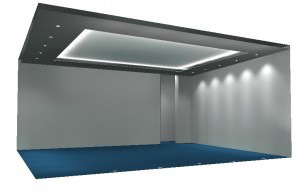 Another approach is to use a coffer ceiling detail; which involves dropping the ceiling around the perimeter (allowing maximum ceiling height in the centre of the room) and hiding linear LED strip inside to wash out across the ceiling. Care needs to be taken with placement of the LED strip to avoid heavy shadows and ensure maximum projection across the ceiling. The LED strip should be dimmable and thought needs to be given to maximum run of LEDs and placement of the remote LED drivers. It’s often easy to forget we can’t see light. We see luminance, objects that reflect light. For a space to appear light and bright, which is particularly important in basements, then surfaces, particularly walls, need to be washed with light. 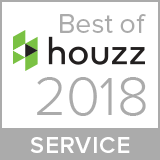 Some of the main options to consider are recessed ceiling downlights or dedicated wall washers, track and spots, floor-recessed uplights, or hidden LED strip in a shadow gap detail. There are many factors to consider before deciding on which method is best. 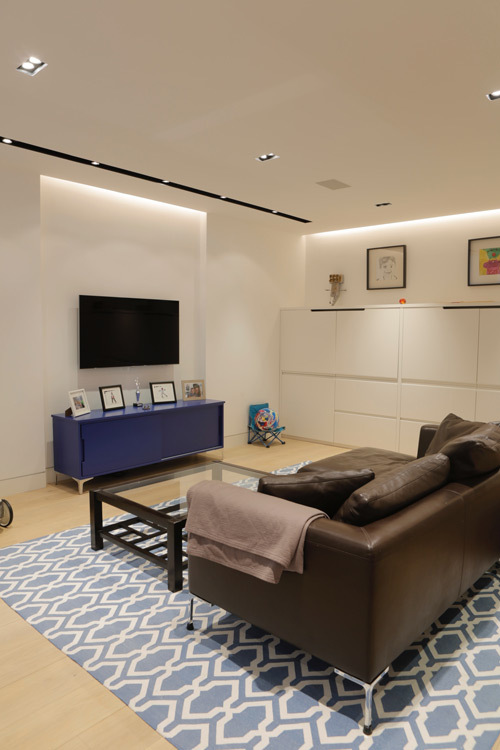 Top tips for basement lighting design. Optimise amount of natural light coming into the space. Consider the function of the room. How will the space be used? Consider what light scenes are needed and how you will control the lighting. Which circuits do you want to be dimmable? Is a control system appropriate? Explore ways of getting light onto the ceiling, consider wall lights or coffer details. Washing walls with light will help the space feel light and bright. We have lots of experience lighting basements, from modest single storeys, to massive triple level icebergs, so if you’re planning an excavation any time soon, get in touch, we would be happy to help.